This accident serves as a reminder of why it is important to follow railway rules and operating instructions. Many rules have developed from the experience of past accidents and incidents. The reason why a rule exists is not always obvious, and may have been forgotten as time passes, but the importance of complying with it does not diminish. The consequences of a train running onto a level crossing into the path of a road vehicle can be fatal; ensuring trains stop at a ‘Stop’ board placed at a safe distance from a level crossing open to road traffic is a sensible and realistic precaution against inadvertent overruns. It is also important that organisations have measures in place to assure themselves that rules and instructions are being followed, rather than allowing unsafe ‘custom and practice’ to develop. 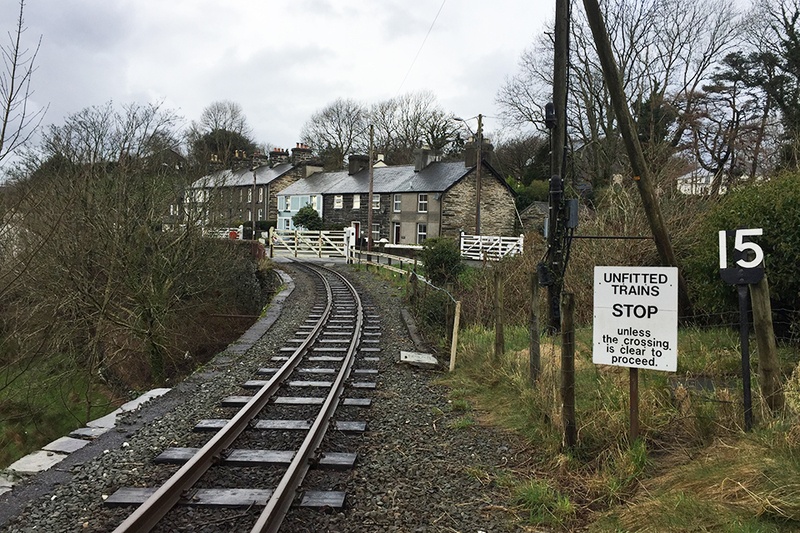 On Sunday 6 January 2019 at around 16:30 hrs, an engineering train returning from Tan y Bwlch to Minffordd did not stop as it approached the level crossing at Penrhyn. The gates were closed across the railway, and the train struck the upper gate and pushed through it, coming to a stand part way across the crossing, fouling both carriageways of the road, the A4085. There were no injuries, and minor damage was caused to the crossing gates on the Tan y Bwlch side of the crossing. On applying the locomotive brakes with the intention of stopping short of the gate, the driver realised that the locomotive wheels had locked and that the train was continuing to move down the 1 in 80 gradient. He whistled for assistance from the brakesman, who applied the vacuum (train) brake from the brake van at about the same time that the driver remembered that the locomotive and brake van coupled to it had vacuum brakes and also applied the vacuum brake. This additional action was insufficient to stop the train in time. The train consisted of diesel locomotive ‘Harlech Castle’. Next was a brake van, fitted with a handbrake and vacuum brake; the brakesman and three members of the railway’s signal and telegraph maintenance staff were travelling in this vehicle. There were four wagons behind the brake van, all of which were unbraked. Two wagons carried a crane and a mobile access platform. The total weight of the unbraked portion of the train is not known, but was probably around 6 tonnes out of an estimated total train weight of 23 tonnes. On the Ffestiniog Railway, a brake van must be provided at the rear of all trains which include unbraked vehicles, when going uphill (ie towards Blaenau Ffestiniog). When such trains are going downhill (ie towards Porthmadog) the brake van may be in any position in the train. The wheels of the locomotive locked approximately 15 metres before the crossing gates. The brakes of the van coupled to the locomotive were not applied until the last moment, and the rest of the train was not fitted with a continuous brake. Witness evidence indicates that the railhead was contaminated, probably with debris and road salt resulting from the spray thrown up by passing cars travelling over the crossing on the A4085. 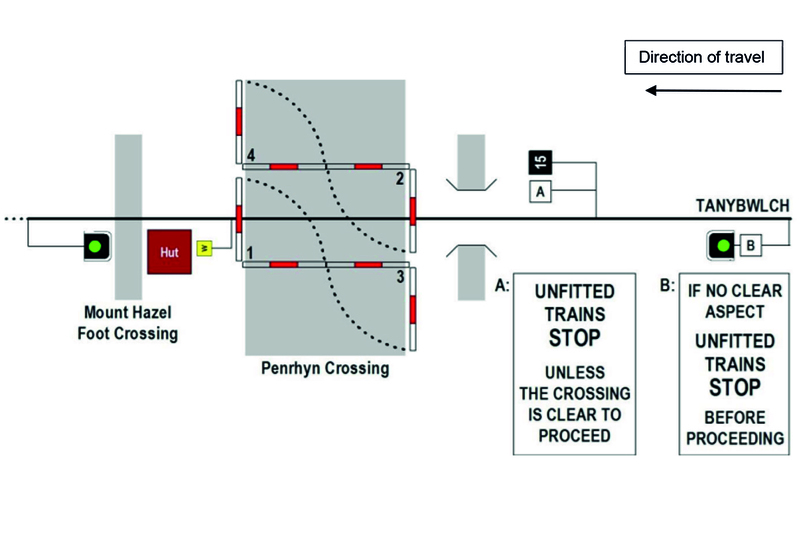 Instructions produced by the operating department of the Ffestiniog and Welsh Highland Railways, state that drivers of unfitted trains (trains without a continuous brake which can act on all the wheels of a train) approaching in the downhill (from Tan y Bwlch) direction must make their approach cautiously, prepared to stop at the crossing gate signal and associated stop board, which are approximately 120 metres from the crossing. If the signal is unlit (which was the case as passenger trains were not running on the railway at the time), the driver must stop at the signal and then proceed cautiously as far as the second stop board, 30 metres from the crossing. Unfitted trains must wait at the second stop board until the crossing has been closed to road traffic, in this instance by the train crew, and is clear for the train to proceed. The driver stopped at the first stop board and then proceeded at walking pace, past the second stop board, with the intention of stopping close to the crossing gates. He stated that this was the custom and practice of the drivers who had trained him when he qualified as a driver in 2013, and, despite the local instruction in the operating procedures and the clear signage adjacent to the line, this was also his usual practice. Figure 2: Extract from the Ffestiniog and Welsh Highland Railways Operating Department local instructions showing the placement and wording of the signs. Direction of travel shown for clarity. From the company’s accident records, it appears likely that the second stop board was installed after the last of three incidents in which trains had slid through the crossing gates on to the road in 1985, due to ice, 1990 and 1992. In the last two cases, railhead contamination from road debris and salt was cited as the cause. The intention of the second stop board was that unfitted trains should be brought safely to a stand before reaching the section of track that might be slippery because it was contaminated with spray from the road. ‘Harlech Castle’ has manually operated sanding equipment fitted, working on the rear wheels of the locomotive, but it was not used on this occasion. There was a further incident in 2007 when a light engine ran into the gates, having been unable to stop due to the wheels locking. Railhead contamination was again cited as the cause. The local instruction for unfitted trains to stop at the second stop board has now been amended to also apply to light locomotives. ‘Harlech Castle’ is fitted with a handbrake, a locomotive brake and a vacuum brake (which was fitted in October 2018). The train had a number of unbraked vehicles, and the train crew did not know the gross weight of the train. Before the train set out, earlier in the day, a rollback test, as required by the rule book, had been undertaken at Minffordd to demonstrate that the handbrake on the brake van was able to prevent a runaway. The driver stated that he was using the locomotive brake rather than the vacuum (train) brake as he had found the vacuum brake handle to be very stiff and difficult to control for non-emergency use. This reduced the overall braking effort available to the driver, as without the use of the vacuum brake, there was no braking effort developed by the brake van. It is fortunate that there were no road vehicles on the crossing at the time of the accident. The descent of the road into the village is relatively steep and due to the curvature of the road and the foliage by the side of the line, road drivers have very little time in which to see any trains approaching on the crossing if the gates are not across the road. Road vehicles coming up through the village in the opposite direction run alongside the railway, though because of the angle at which the railway crosses the road, the curvature of the railway line, and foliage, they would get very little warning of a train running through the crossing gates. In 1973, 2003 and 2005, collisions between narrow-gauge trains and road vehicles at level crossings, which were the result of errors by motorists, caused fatal injuries to three train drivers on the Romney, Hythe & Dymchurch Railway in Kent. The small size of narrow-gauge rolling stock makes people travelling in the trains particularly vulnerable in such circumstances. RAIB report 14/2008 describes an accident at Lydney Town on the Dean Forest Railway on 15 August 2007 in which a train failed to stop in conditions of poor adhesion and ran through level crossing gates, resulting in serious injuries to the crossing keeper. In this case the train was travelling at excessive speed, the rails were wet, the train crew were not adequately trained in handling the brakes correctly and there was no sand available to improve adhesion. RAIB recommended that the railway should amend its safety management system and operating procedures to reduce the risk of a reoccurrence. Note: Although described as the Ffestiniog railway, the legal name of the company is the ‘Festiniog Railway Company’. This company name reflects the contemporary spelling of Welsh names when the company was formed in 1832.